This is, at least for me, a box-ticking restaurant. I guess we all have our own individual preference boxes, but there can’t be too many of those that wouldn’t be garnished with a big golden tick after a visit to Pied à Terre. This Michelin-star restaurant was established in 1991, with the support of the charming David Moore, founding Director. He is very much visible at front of house in Pied à Terre. He has impeccable hospitality credentials, having been associated with such celebrated establishments as The Box Tree in Ilkley and Le Manoir Aux Quat’ Saisons in Oxfordshire, and other high-end restaurants in Europe. This is an eminently missable restaurant; that is to say, it’s one that could easily be missed, with its somewhat anonymous entrance. It has a narrow frontage, but it goes back a depth to present a cosy restaurant with low ceiling, banquettes and a skylight. It accommodates couples and small groups in intimate fashion. The staff are friendly and attentive while offering unobtrusive classic service. This was our first visit, although I sense that it will be the first of many, to Pied à Terre. We chose the Tasting Menu to give us a solid overview of the food. It proved to be a worthy choice, with all dishes being outstanding and a few being positively memorable. Head Chef Asimakis Chaniotis amuses, tempts and woos his guests in equal measure. The construction of his dishes is always thoughtful, sometimes telling a story, and always showing his fine culinary skills to great advantage. He draws from his own Greek heritage but takes advantage of the best and freshest of British ingredients. We started with canapés of salmon mousse encased in red chocolate lips; beef spring roll; and ‘soil’ with radishes. There was a cardboard egg box cradling Kayiana eggs (Greek scrambled eggs) with feta cheese. 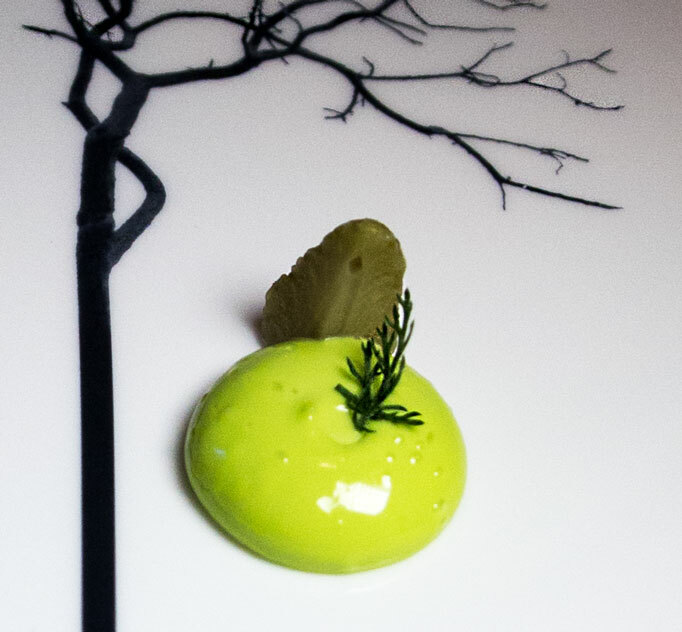 A whimsical start to a striking meal. The first course was Pembrokeshire Crab with Green Strawberries, Samphire and English Fresh Wasabi, and Lime and Ginger Air. This was artfully displayed on a pure white plate decorated with a twiggy silhouette of a tree – so simple, but that stark canvas focused the diner very much on the food. The next dish was Les Escargots de Ma Mere au Vin Rouge et Tomate. Sounded very French but in fact it’s a recipe from a very Greek mum: that Mere is the chef’s! This was perhaps the best plate of snails I have ever had. I would be happy to return for just these, a basket of bread and a glass of red. These must surely be a signature dish at Pied à Terre. 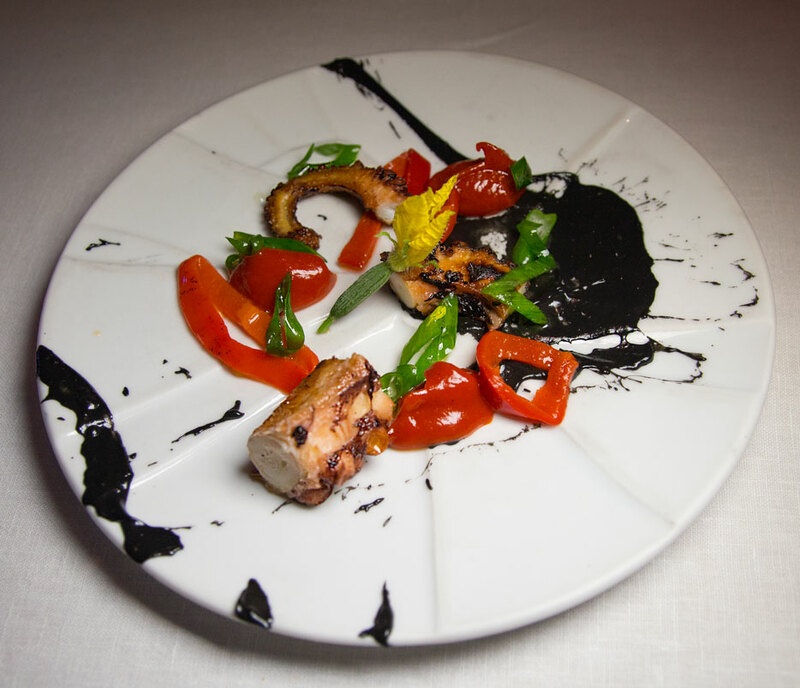 Octopus in Squid Ink with Red Peppers was a Picasso on a plate. Every colourful item worked in harmony with the next. Yes, this is seafood culinary artistry and beautifully done, but it must work as a taste experience as well as a visual adventure. This did, and so did the following Cornish Red Mullet with Potato Spaghetti, Coconut and Saffron. 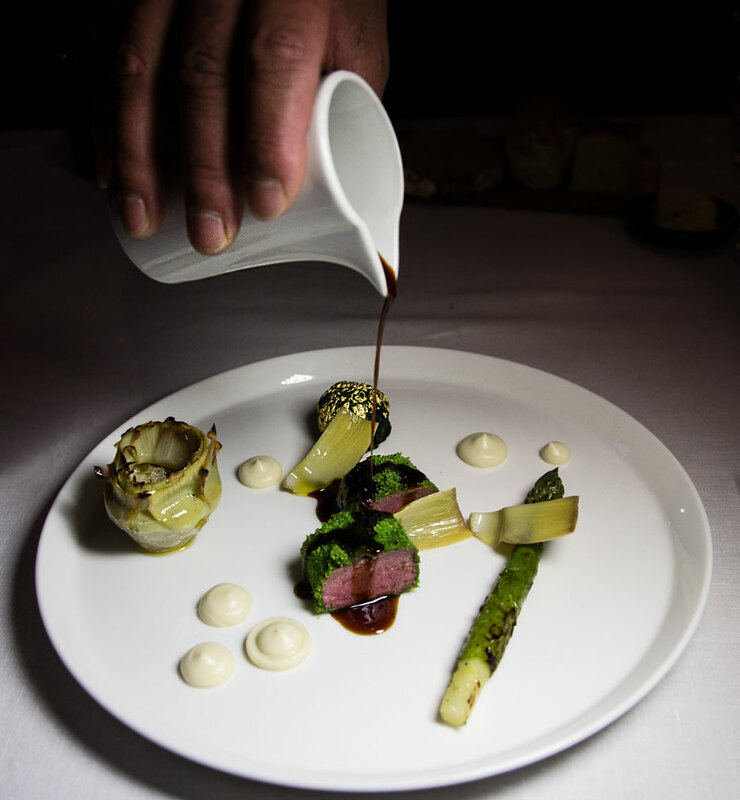 Lavington Lamb, Baby Artichoke, Savoy Cabbage, Tarragon and Grilled Green Asparagus was the most substantial of the plates, and full of innovation. The meat was flavourful and melting, the vegetables were sweet, and the cabbage was gilded! The gastronomic extravaganza continued with Cheese on black and crisp Charcoal Lavoche topped with a Pedro Ximenez jelly; sweet Carrot and Mandarin sorbet with Greek Yogurt Mousse and a garnish of Lemon Thyme; followed by a spring dessert of Citrus Cremeux and Hazelnut, Meringue à la Française. The meal took us for a trip around Europe with not even a mention of Brexit! This restaurant has a Michelin star and it is truly deserved: it was a pleasure to visit. I highly recommend Pied à Terre. I am not the first and I won’t be the last – it attained its first Michelin star in 1993 – and I see a continued glittering firmament in its future.